Seconded! That's a first rate shot! 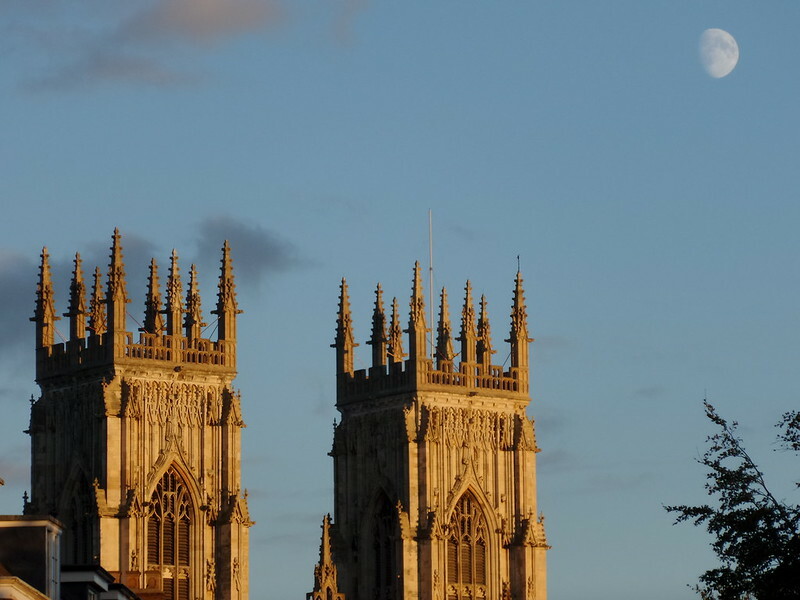 Wandering down the road, I couldn't not take this picture of York Minster in the autumn sun with the moon waiting in the corner of the frame. It was quite cloudy, but I managed to get a few shots through the gaps. The cloud created some atmospheric colours. This is the best one I captured on my nikon d5200. The D80 was my first DSLR and I purchased it back in 2006 when they came out on a recommendation from one of my friends. It was a hard slog at first, damn it took me quite some time to get use to it and even then I never really used her in Manual mode so I never really got the best out of what is actually a really nice DSLR (if a little dated now). Its 10 mexapixels are nothing compared to todays modern phones (yet if anyone says a modern phone will produce a better picture than the D80, I will continue to laugh at them, it may not have the megapixels but by god it does have a better sensor), and its 24mp replacement 2 years ago which is now going to end up being my backup camera (Nikon D7100, excellent bit of kit ) really got me into playing with manual settings much more and pointed to the weaker aspects of the D80 (low light being the most obvious one as well as the 10mp v 24mp). Still, I dont think its the end of the line for the old girl, the D80 will be confined to another bag and leave my main rucksack to the D7100 & D750 and a few lenses (plus spare battery etc), and considering the kit lens isnt the greatest, it can still produce some decent pictures. It has been a nice journey into the world of digital SLR's with the Nikon, I may have a plan in the future for the D80 but for now she will just rest in another camera bag and gather a bit of dust (considering its not worth much anymore which is a shame, she may well get used by some other people, we shall see), its a great starter camera (or the D90) if anyone wants to take up photography (though the 3000 series is more user friendly with its built in guide). A few pictures from last week when the sun was out, showing the old girl still has a few snaps in her yet (JPEG and uncorrected/cropped). First 2 are hand held and amazingly not bad for a none VR lens shooting around 1/10. Spooky reading your post re cameras and the mild mention of mobile phones , we are off on holiday driving to Spain tomorrow and have given up on our iPhones and have got my Panasonic camera back out charged up and ready to go , all too often the iPhone's have a mind of here own and the the pics are poor.too late when the moment has passed. Are you asking DKZ about his baubles...ooo err!! Hi I think you should of kept the old TV and put the money towards Quads ? I'm no whizz with a camera but sometimes I surprise myself. Some mornings, the view to the South has cloud filling the dips, so we are above them. This is from our balcony, with an uninterrupted vista of some 50kms or more.